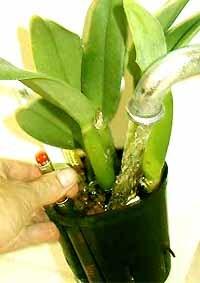 Oncidiums usually adapt to hydroponics without incident. Plants with healthy roots transfer easily. If your plant had damaged roots however, a little "tender loving care" might be needed. Water to 1/4 - 1/2 on gauge. 1/2 is middle line on indicator. Wait until system is dry before rewatering. Light: Bright light with some direct sun is ideal. Temp: Omcidium like cool temps 65-75 degrees during the day and 50-60 degrees at night is best. Water: Water to 1/4 - 1/2 on gauge. Then wait until system is completely dry before rewatering. We find healthy Oncidiums to be heavy drinkers after transplanting.The LECA pebbles in our system seem to be the perfect media for their rather thin roots. As moisture is "pulled up" from the bottom by the LECA pebbles, fresh air circulates around the roots. The perfect environment for new root growth! 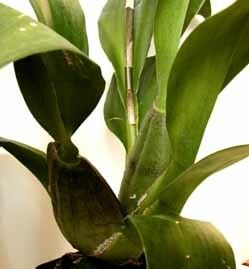 Healthy Oncidium roots are almost white in color and have a supple texture. If you found rotted and mushy roots when transplanting, your plant wasn't happy in its old pot. The roots where suffocating as the potting materials decomposed. This potting mix did not drain well and the roots where too wet. Another common sign of trouble is wrinkled pseudobulbs. Wilted, wrinkled psuedobulbs means your plant's root system has shut down and isn't absorbing water. Your plant is dehydrated. The image below shows the difference hydroponics can make. I'm holding an Oncidium with a dehydrated pseudobulb on the left. The decaying root system just wasn't delivering moisture to the plant. The plant on the right has active roots. See the difference? Decaying roots. Healthy Oncidium roots should be white. Did your old roots look like this? Wilted plant! Your first instinct is to more water. Inactive roots need more air, not more water. Water plant by running fresh water through the pebbles at the sink. Return plant to outer pot. Do not allow standing water at the base yet. The space between the LECA pebbles and the openings in our culture pot will promote good air circulatation around the roots. This stimulates new growth. 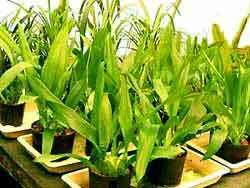 Older psuedobulbs may never fully recover. A better approach is to watch the new growth. You can see a new growth in the image comparing plants above. Run fresh water through the roots 1-2 times a week. Mix KLN (2 TSP per quart). Take the plant (and inner pot) to the sink and slowly pour KLN solution through the pebbles. No nutrients yet. Nutrients are for leaves and flowers and can actually be harmful to undeveloped roots. Return plant to outer pot. Repeat process 1-2 times per week. Store unused KLN solution in a cool, dry place (refigerator is good - be sure to mark the bottle!). These plants will take 4-6 weeks to respond. When it looks like it's recovering (starts looking perky or forms a new growth tip), return to the regular watering routine along with nutrients. Otherwise, continue watering with this process until plant recovers (or until you decide to give up and send the poor thing to "Plant Heaven"). Note:To prevent spreading disease, don't try capturing solution for reuse at the sink. gives new roots a boost.